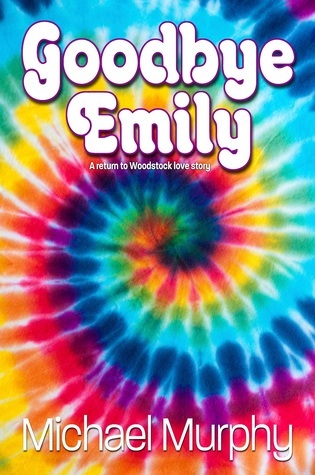 The garish, tie-dyed cover of Goodbye Emily by Michael Murphy (Koehler, 270 pp., $16.95, paper) fairly shouts that the book is about the psychedelic sixties.That is a form of truth in packaging as the focus of the book is Woodstock and what befell three friends who made that pilgrimage and whose lives were changed by that great adventure. The hero of the book is a broken down old English professor, Walter Fitzgerald Ellington. He’s pining away with a broken heart for the love of his life, Emily, whom he met and fell in love with at Woodstock. Emily died of cancer, and Professor Ellington was riffed from his tenured faculty position at Milton College around the same time. His life becomes aimless and centered on the joys of the bottle. He conceives the notion of returning to Woodstock to scatter Emily’s ashes. His companions for this journey can only be the buddies he went to the giant 1969 rock festival with in the first place. Professor Ellington reactivates those long-ignored friendships, which is not easy. One of his old buddies is Buck, a damaged Vietnam veteran who carries with him the gruesome image of an ambush near Danang. The image of Buck’s sergeant’s severed bloody head rolling into his lap has fueled his nightmares for decades. The mortar round that took off his sergeant’s head also left Buck with a shrapnel wound to his knee. The other buddy is Josh, a sixties folk singer languishing in a nursing home totally out of touch with reality due to advanced Alzheimer’s. It proves necessary to kidnap Josh from the facility for him to be a part of this “roadtrip”—a word Josh says over and over during their journey. This journey is made in Emily’s old van, which Buck decorates with psychedelic paint and a large peace sign. This heart-warming but sad tale is told effectively in back and forth chapters, from the present to the actual weekend of Woodstock. I liked the historical Woodstock sections best, but both parts of the story are very well told. I didn’t go to Woodstock, but I did attend several rock festivals of that sort, and I think the author does an excellent job of summoning up that long-gone era. He does that in a positive and life-embracing way that made me nostalgic for the sixties and all that entailed. I couldn’t help but think that those were better times, mud and all. Of course, part of the reason for thinking that way is that now I am old, sick, and dying of Agent Orange-caused cancer. That might explain some of the emotions I brought to this novel. One of my heroes, Jimi Hendrix, makes an appearance near the end of the chapters on Woodstock. The author does a nice job with a scene between Jimi and our hero and Emily. Mostly, though, I do not agree with the cover blurb that characterizes this book as “irreverently funny.” I am willing to concede that the problem is likely with me, as this journey of self-discovery seems more one of sadness than joy. No matter what personal discoveries the professor makes—and he makes some—Emily, the love of his life, is still dead. That cannot be changed. You can’t go home again, and you can’t go back to Woodstock again, either. We’re shown the main characters at the beginning of their lives, teenagers in love with life, and then we’re shown these people near the end. Sad stuff to me. The professor does overcome his emotional problems, and sets about going on with his life. So in that sense, the novel is positive. But Josh still is dying of Alzheimer’s and Buck still has shrapnel in his knee. We are meant to see that the journey has reawakened their lives and helped them in their relationships with others, and that has happened. Goodbye Emily is a powerful trip back in time, and also forward to the possibility of new lives. I recommend it to those who look for some hope near the end of the line.